The Exeter Hip has been listed as one of the UK’s 100 best breakthroughs. 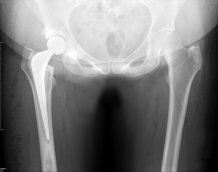 The prosthetic implant is used in 125,000 hip replacements every year and nearly 2 million people around the world have one. It was designed in 1969 by NHS surgeon Professor Robin Ling and Dr Clive Lee, an engineer at the University of Exeter. When Robin Ling died in October 2017, the Royal Devon and Exeter Hospital named a ward after him. The Universities UK list of breakthroughs demonstrates the impact of the research conducted at UK universities.